Okay! Here are the tweets without further comment! Chapter 13 sees Rey recalling her strange connection with Kylo back in TFA, which was a scene I really wanted to revisit. I think it's a key to understanding just how complicated their relationship is, and how it resists being boiled down to X -- whatever someone thinks X is. Rey doesn't "download" Kylo's powers like in The Matrix. She already has great (albeit latent) power. By being in Kylo's mind, she accesses his training, not his power. Parallels are hard, but imagine the muscle memory and environmental awareness for being, say, an archer. It's a shortcut, yes, but to powers within Rey's capabilities. And here's the important thing: she doesn't regard it as a blessing. She's *terrified* by what's been let loose. As she tells Luke, something in her is awake and she's afraid. She needs help -- and he won't help her. Which touches on what I find so fascinating about Rey and Kylo's relationship. Lots of fans assess it as a potential romance, and maybe that's ultimately what it will be. (I have NO idea.) Certainly the famous scene in the hut verges on that. But we fall back on romance because it's the best analogue we have. Rey and Kylo's relationship is more intimate than that. They've literally been in each other's minds. Rey's seen his deepest fears; he's seen the past she's buried. None of us have had that experience. My point is romance may not be the endpoint of that. (Though it may be.) The analogue may be misleading, because it's an analogue. Their connection is deeper and stranger and far more complicated. I think TFA/TLJ covers those complications wonderfully, with Ep IX promising more. They can write anything they want, even that Ben and Rey are twin Siamese twins. "You are nothing, but not for me!" If that's not a romantic proposal, I'm a giraffe! Chapter 21, and the Force connecting Rey and Kylo again. I really like the way Rian built up to the elevator reveal about Rey's parents. It's interesting to speculate about why Kylo alludes to what he knows here, but doesn't drop the bomb. Note also that Rey talks about the connection with Kylo letting him pillage her memories and feelings. She didn't *want* him in her head -- the TFA interrogation scene is a violation, one that suddenly rebounds on Kylo. And then very strange things start happening to them both. Like I said earlier, the connection is deeper and stranger than the analogues, and not all of those analogues are comfortable ones. I think that complexity is great storytelling. 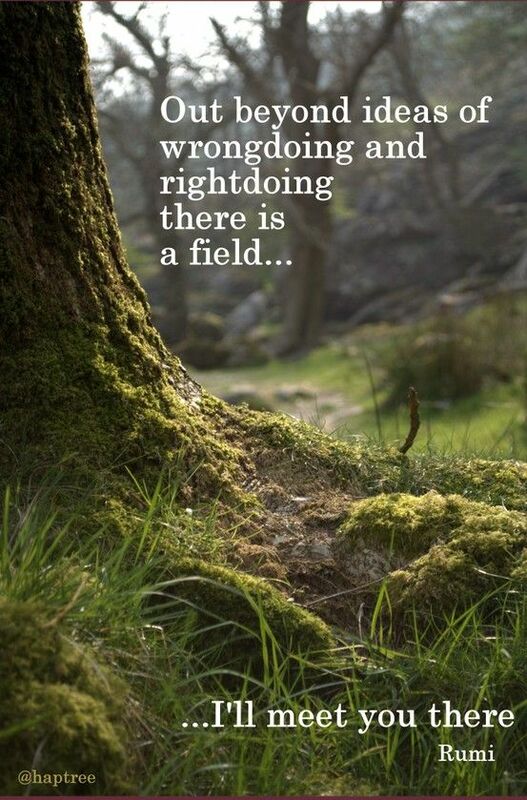 We just have to remember this is still the middle, with lots of complications but no resolution. I love Rian's use of the visual language of film to tell stories. There are the three flashbacks, of course, but I was pretty confident abt translating those to the page. But the transition between Rey in the cave and Rey/Kylo in the hut was the biggest challenge in the project. After the cave we hear a voiceover of Rey reflecting on what's happened. As moviegoers we know that means time has passed and she's recounting the experience to someone else. The shock is seeing that she's confiding in Kylo. It's a great use of film's conventions and language. How in the world do you replicate any of that on a page? I had no idea. I figured some answer would come to me subconsciously as I wrote, but I got to that transition and still had nothing. Cue a couple of days of walking around in circles muttering. I saw I had to recreate that using prose conventions. The voiceover became Rey's reflection, reaching back to Jakku and echoing Tatooine Luke and bones in the sand. Rey decides whom to tell, and the head fake is the description points to Luke, who's even in the next little scene. I loved having Rey and Kylo's verbal fencing here, but on further review Kylo shouldn't have smiled. Some readers objected that Rey couldn't have heard Finn challenge Kylo back on SK Base, but I saw her as dazed and hurt (to quote the TFA novelization), not actually unconscious. I just feel the need to post these because indeed there is an obsession to get hints which turns into a game to the point when one forgets that it can have consequences. Between the two tweets there was someone saying it looked like Twitter was starting to annoy him. That’s why he starts with “It’s not.” I like his earnest answer. The Rey scene that ends Chapter 29 had an interesting genesis. We had a placeholder for a possible fight scene, but that felt wrong to me. I realized what I wanted was much quieter: Rey has just had everything she thought she knew upended. I wanted to see her take stock of that. I still had lots to work with. Why did Rey spare Kylo? What does she expect now? The answer I came up with brought together a lot I'd explored: Force visions, being its instrument, understanding its will, Kylo's future, Luke's mistakes, and Rey's own. Not bad for a little scene! He says he will finish his commentary tomorrow. I think I did a good job with Snoke considering Kylo. I like the duality of this section -- Snoke's disappointment is the same thing that's given Rey hope. I also liked the question of whether being made from both dark and light is a profound strength or an insurmountable flaw. My strategy was to show the fight from Rey's POV, and let us see her newfound sense of the Force paying off. Her realization is much the same as Luke's in Weapon of a Jedi, which is not a mistake. And her sense of being the Force's instrument will be important again soon. Well, many missed the thigh grab on first viewing, but I guess it was some diligent Reylo who cut it and posted it, and the rest is history! 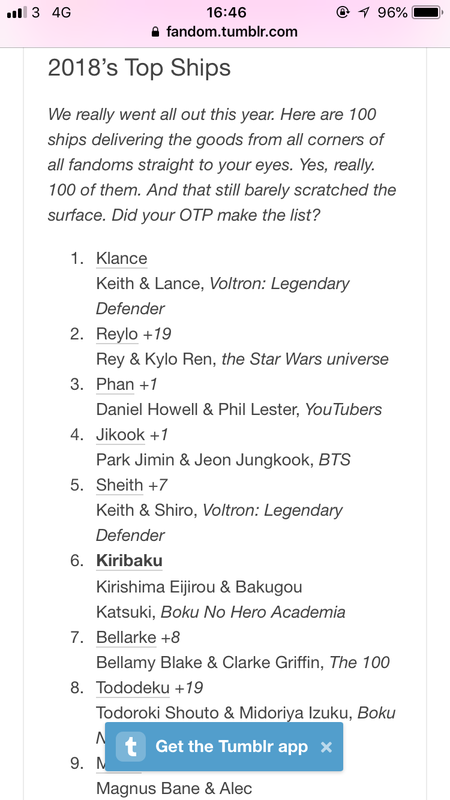 Reylo is the #2 ship of the year on Tumblr! I really love Jason Fry’s long thread on the TLJ novelization. I feel like reading the book again in light of all his comments. And I like the fact that he also mentions where it could have been better in his opinion. Humility. I kind of hope he’ll be at the celebration next year. He could do a panel on his own explaining his writing process and giving tips. I’d attend it. 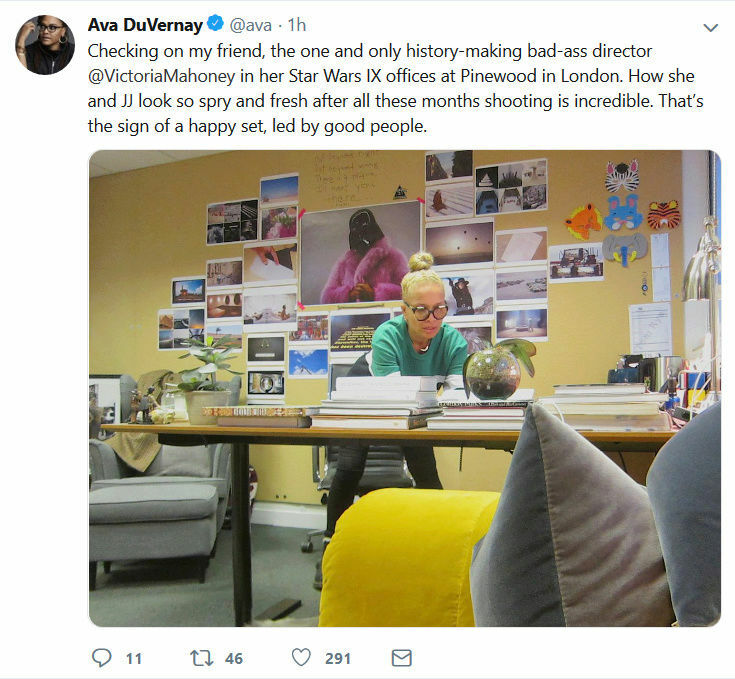 Ava Duvernay is visiting the IX set at Pinewood. Given that she suggested the choker shots in TFA, wonder if she'll have more suggestions this time around. I might be reaching but that sounds so Reylo! @californiagirl wrote: Ava Duvernay is visiting the IX set at Pinewood. Given that she suggested the choker shots in TFA, wonder if she'll have more suggestions this time around. Now this is a photograph that will be closely studied! Look at all that on the bulletin board!!!! Wait?! She suggested the choker shots? Well Vic Mahoney, along with JJ, are the original Reylos... It's the choker shot that caused a lot of people to hmmmmmm...there is something going on here, along with the capture and interrogation. I think it refers to Vader and Padme. In Vader's comics he is desperately trying to reach her through a portal on Mustafar.. I think the broken love of Anakin and Padme will have connections with Reylo. At first I thought that Rey and Kylo were the reincarnation of Anakin at Padme, but since the Star Wars authors say that the relationship between Rey and Kylo is much more than romantic I thought that Anakin and Padme, Luke and Leia, Ben and Rey Are an emanation of the Force. That could be the Force that is divided into two part (male and female) to seek balance. Balance that should be achieved by making the right choices "for love". Lol we posted same post at same time ! Reylo minds think alike ! I think it refers to both couples - Anakin/padme and kylo/rey- very poignant though - it made me well up and get a bit teary . Ok, but who is gonna zoom in so we can read that opening crawl? I think the reincarnation angle would kinda muddle things; and take away from the tragedy that is Anakin/Vader. I feel very much that "Act One" (Anakin/Padme) had to be a tragedy because without that failure we have no context for the eventual victory. Think of it in terms of The Lord of the Rings. If Ilsidur did not succumb to the One Ring's temptations (instead the Ring was lost through no moral failing of his own), then we'd have no concept of the Ring's power to tempt even the pure and noble and therefore the moral courage it took for Frodo to carry the Ring to Mount Doom and almost to the cusp of throwing it in; nor would we appreciate Aragorn's ability to send Frodo and the Ring away from the Fellowship before he could succumb to the temptation (thus marking him as even more worthy a king than his ancestor Ilsidur upon whom his claim to the throne of Gondor rested). In other words, we NEED the failure of Anakin/Padme (and to a lesser extent Han/Leia) to appreciate the context of how Ben/Rey will achieve their victory. Also worth considering is who, precisely is the third party... because it was not just Anakin/Padme's failures, it was also Obi-Wan's failures. It was not just Han/Leia's failures, it was also Luke's failures. Obi-Wan was like a brother to Anakin and dear friend to Padme. Luke was brother to Leia and like a brother to Han. If it rhymes then somewhere in the mix is this brother figure who might be the thing that will also get it right this time through. My money is on Finn, who was lost to the First Order before he defected and so is kin to Kylo in that sense and is like a brother to Rey. I think the test here, mirroring Obi-Wan will be that Finn will be able to accept and forgive Ben for his past actions (whereas Obi-Wan believed Anakin to be lost forever to the dark side). Finn doing so would go lightyears towards getting everyone else to accept Ben's redemption. Chris24601 You do a Beautiful comparison with Finn. Unfortunately I don’t speak English well otherwise I would like to talk for hours about this with you. But I can read english, please write more and tag me when you do. I wanted, those three little hanging lamps." where the two worlds touch." "I would love to kiss you. The price of kissing is your life." that will never be said by anyone." @rawpowah wrote: Ok, but who is gonna zoom in so we can read that opening crawl? It’s the TFA opening crawl. A picture of Han’s dice is also there btw. Fire dies down and doesn’t destroy. OMG. That's so awesome. Really hope this has something to do with Reylo.